Each pack contains approx. 4 servings at a standard rate of 1 oz per serving. 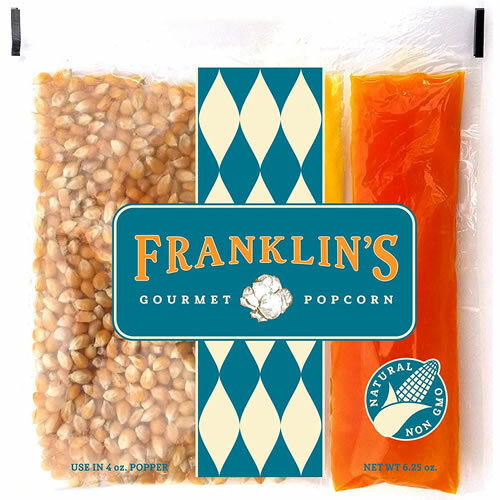 These Portion Packs are the perfect way to enjoy Franklin’s Gourmet All-Natural Popcorn. Our 100% Organic and grown in the US kernels are perfectly paired with a delicious healthy coconut oil and the perfect blend of salt and buttery seasonings to give you the old time theater popcorn taste. Each case comes with 10 individually packaged packs as shown above. These portion packs are measured by the amount of popcorn popped. Each oz is about one serving. The portion packs are made to easily slip into a home or commercial popcorn machine and pop within 3-4 minutes. You can also use the portion packs in a non-stick pot. We find the popcorn tastes best after it sits for a couple minutes. This gives whatever steam is left from the popping a chance to leave and keeps your popcorn from becoming chewy.